Many enterprises use Office 365 in their organization to monitor their network. Unfortunately, the native tools in Office 365 lack important auditing and alerting capabilities and only offer a few predefined reports, making them insufficient for keeping track of everything that happens in your Office 365 environment. Luckily, Log360, an extensive Office 365 reporting, auditing, and alerting solution, can help you effortlessly manage your Office 365 setup. Log360 provides over 200 predefined reports for Office 365. It consolidates data from Exchange Online and Azure Active Directory into detailed reports which can be scheduled and exported in multiple formats including PDF, CSV, XLS, and HTML. 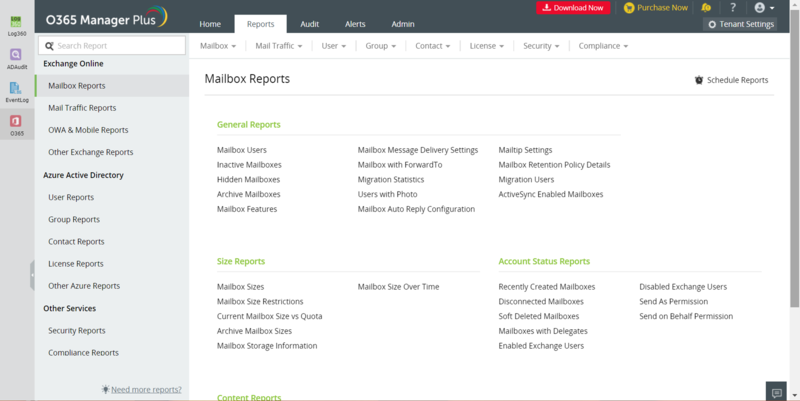 Monitor mailbox traffic to see details on the amount of good mail, spam, and malware-infected messages entering and leaving your organization. Identify inactive users, soon-to-expire licenses, and soon-to-expire passwords with reports on Azure Active Directory. Meet IT compliance standards such as SOX, PCI-DSS, HIPAA, GLBA, and FISMA with the help of compliance reports. Log360's audit reports monitor every event that happens in your Office 365 environment, so you can take preemptive actions against cyberattacks and avoid dire consequences. 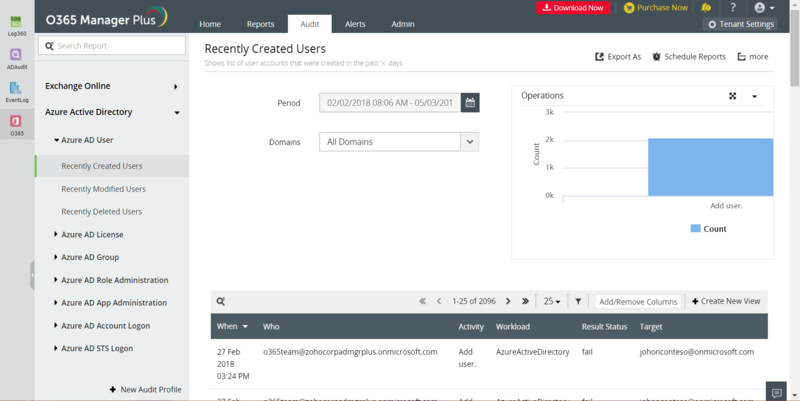 User log ons and log offs to monitor the behavior of Office 365 users. Critical license changes made by users to avoid license-related issues. Log360's alerts keep you in the loop when critical activities and changes happen in your Office 365 environment. 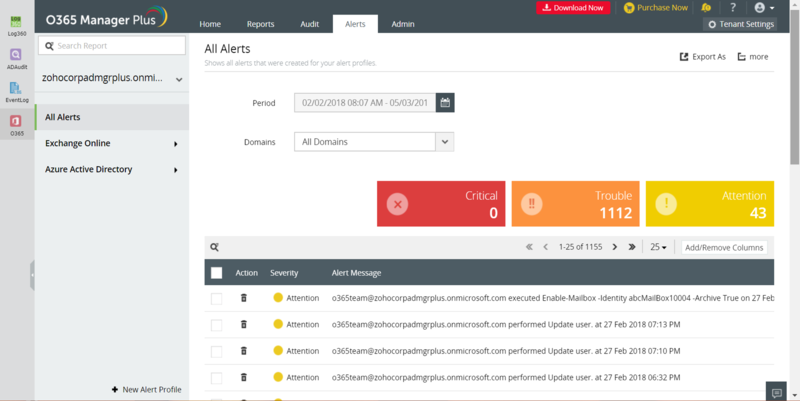 You can create custom alerts and save yourself time when you no longer have to constantly check audit reports for malicious activities. Set up email alerts which will inform administrators about which action triggered an alert, helping them locate the source of the action immediately.